Growers can now ensure their greenhouse crops experience ideal lighting conditions regardless of changes in weather or other light-limiting factors. Simply plug-in your smartPAR™ Light Sensor Modules into your LumiGrow fixtures. Connect to your smartPAR™ network, and set your daily light integral (DLI) by using in-app recommendations through the smartPAR™ Sensor Program Wizard (powered by our LumiGrow Plant Research Group). 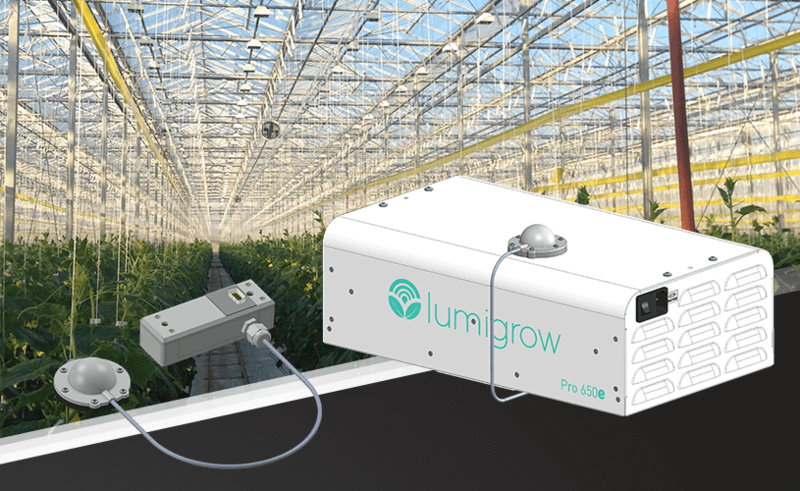 Your LumiGrow LED fixtures will now begin to automatically stabilize light levels inside the greenhouse regardless of climate, shadows or transmittance rates. In the video above, we take a look at comparative data collected during the summer from Cabrillo College’s greenhouse in Santa Cruz, California. We see that even on a clear sunny day in California, additional light is often required to reach optimal lighting targets. Light is one of the most powerful growth variables at a growers’ disposal, and certainly one of the most significant investments for your operation. With the smartPAR™ Light Sensor Module, you’re smartPAR™ Software collects solar data to find the perfect balance between crop vitality and maximizing profits. You’ll never have to worry about over-lighting or under-lighting your crops again! Order your smartPAR™ Light Sensor Module today, and you’ll gain access to our preliminary smartPAR™ Reporting and Data features. Gain access to reports for understanding energy-usage, solar light trends, and climate factors that will influence your entire cultivation strategy. Apply this data to plan an even better cultivation strategy for your specific microclimate, and keep improving season-by-season and year-over-year. Contact Us to Order Your smartPAR™ Light Sensor Modules!